Lately I discovered libnfs which is I quote (from github) is "a client library for accessing NFS shares over a network". I have released a few days ago a proxy for imdisk to allow one to mount a disk image via NFS (see here). This time, this is a client (GUI and command line) which I release. The idea is to make it lightweight, portable and easy to use NFS client (not to mention free obviously). I have not tested it yet but it may very well be that this works from WINPE as well. I feel that this could come handy when playing with disk images on a network or when pxe booting. That could also lead to further developpement around CloneDisk or Tiny PXE Server. Download here (command line) and here (GUI). Note that the read command will dump (purposedly) the content to the console so it is up to you to pipe out to a file, etc. because later become so or so different packages.. and the gui and cmd line files be not huge and can distribute side by side..
and the Gui executable name stay under 8 letters ..
connect to an other computer and hang in a folder from an filesystem more better and directly as samba. So it is nfs a "Network File System" and meant not directly a single file more a fileSystem..
connecting and copying to other computers ..
the mounting iso' fs is only a enhancement at nfs ..
the next is, we need a other folder / FS to hang in where have give outside from Port ..
for letters+openbutton for selecting a folder where it is possible to hang it in..
okey, in short, i have take your picture for add all the suggestions to have a good working NFS-Gui . the so-called Suid and Sgid bit. Programs with the set user ID set are executed under the user ID of the file owner. 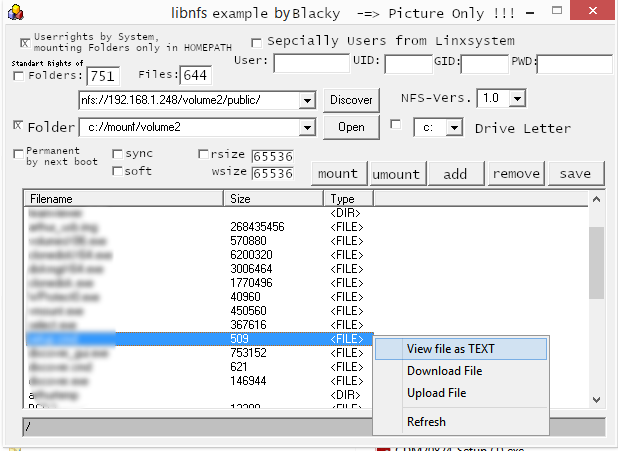 Programs with the set user ID set are executed under the group ID of the fileset. For example, if a program belongs to root, and the suid bit is set, then the executing user has root privilege for that one program, so to speak. This is often used for programs that need to access interfaces that the average user has no access to for security reasons. This bit is set or reset with the chmod command as above, except that an additional digit is added before the usual number triplet. If this digit is missing (the normal case), it is set to zero. This allows the normal user to use lpr to access the printer interface / dev / lp0 without being root even though it belongs to root and has no write access to it. Therefore, one should thoroughly examine a program before setting its sui or sgid bit. for the owner .. if i am right..
i don't know if 000 for files or for folders works.. :\, never testet..
for folders 755 for all others and group or setting up by configuration ..
good for as example webfiles .. if in reactos extfs possible have reactos the same user and group possibility's .. 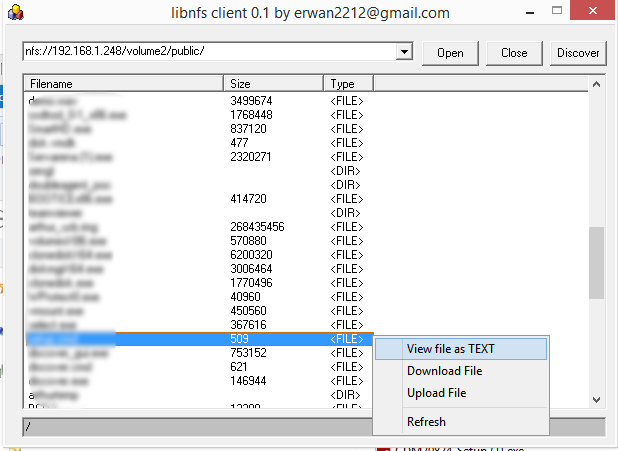 But if you set by the Users, for folders 700 or 750 and for files 600 have only the user the possibilitys to read..
Exit is possible by klicking on Titlebar the "X"
or you can add more space under the List window below and add bottom right a save and close button.